Some popular picture books in our new book displays – purchased through Scholastic book orders. 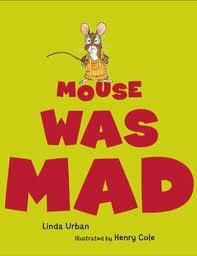 Mouse was Mad by Linda Urban and illustrated by Henry Cole. How is little mouse going to express his anger? His stomping can’t shake the trees like Bear. His screaming doesn’t echo through the woods like Bobcat. This makes him so mad that he stands perfectly still. He breathes. The other animals join in, breathing too. Suddenly mouse is no longer mad. Hmm. . . Look what breathing can do for you! For a MindUp classroom, this book made a whole lot of sense! 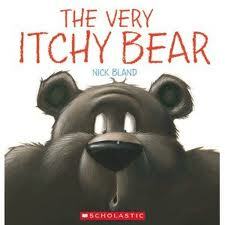 The Very Itchy Bear by Nick Bland is very amusing. The Very Cranky Bear returns – this time bothered by a troublesome little flea. Absolutely annoying until Bear flicks flea into the ocean and finds himself all alone and flea finds himself almost dinner for a hungry bird. In the end, these two become appreciative friends. Chris Barton and Tom Lichtenheld bring us the award winning bestseller Shark vs. Train. This book is pulled off the shelf almost daily. It is pretty hilarious. 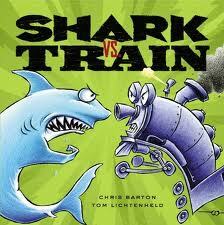 In the hands of little toy box raiding boys, shark and train come to life to battle. Who will win in these very imaginative scenarios? In a hot air balloon? Roasting marshmallows? (hint – shark is all wet!) Giving rides at a carnival? Playing hide and seek? (Really they both fail miserably on this one – steam and fins are just too obvious!) Who wins in the end? The call for lunch! 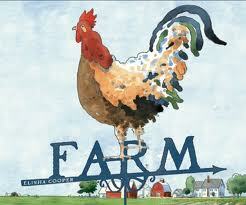 Today it was a book to read and chase me with, recounting new facts learned. “Ms. 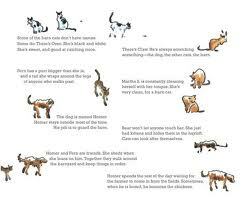 Gelson did you know that cats eat grasshoppers? “Ms. Gelson, dirt can look like dark chocolate!” On and on! I love new books! Happy reading! This entry was posted in Picture Book Love and tagged fiction, great read alouds, information story books, MindUp, picture books, Scholastic books by carriegelson. Bookmark the permalink.